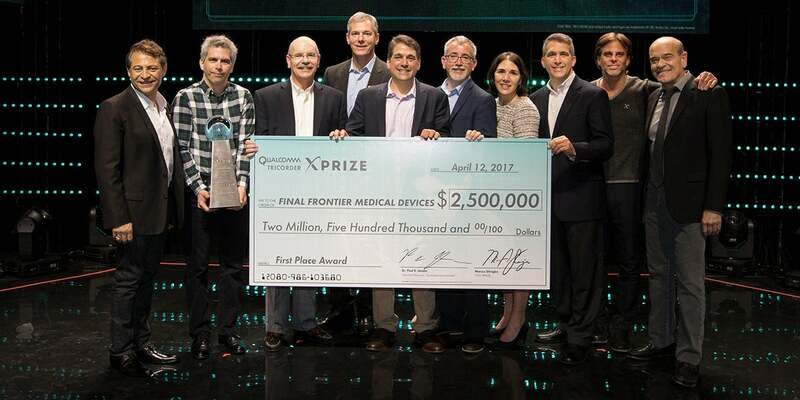 LOS ANGELES (April 13, 2017) - XPRIZE, the global leader in incentivized prize competitions, and the Qualcomm Foundation have awarded millions of dollars to the finalist teams of the Qualcomm Tricorder XPRIZE, including a top prize of $2.6 million to the Pennsylvania-based team, Final Frontier Medical Devices, led by brothers Dr. Basil Harris, an emergency medicine physician, and George Harris, a network engineer. A second-place prize of $1 million was granted to Taiwan-based finalist, Dynamical Biomarkers Group, led by Harvard Medical School Associate Professor Chung-Kang Peng, Ph.D. and supported by HTC Research. Launched in 2012, the global competition challenged teams to develop a consumer-focused, mobile integrated diagnostic device inspired by the medical Tricorder of Star Trek® fame, first shown to TV viewers more than 50 years ago. Final Frontier developed an affordable device that can diagnose and interpret a defined set of 13 health conditions to various degrees, while continuously monitoring five vital health metrics. Dr. Paul E. Jacobs, Executive Chairman of Qualcomm Incorporated, Dr. Peter H. Diamandis, Executive Chairman of the XPRIZE Foundation, and Marcus Shingles, CEO of the XPRIZE Foundation announced the results at a ceremony in Los Angeles. In addition, XPRIZE and the Qualcomm Foundation announced several initiatives and additional award funding to support the two finalist teams, as well as the other four semifinalists, to scale the impact of their innovations through a first-ever post-competition series of investments, dedicated to continued product development and consumer testing, trial implementation in developing countries, and industry adoption of the devices. After four years of development, team Final Frontier created DxtER (pronounced “Dexter”), an artificial intelligence-based engine that learns to diagnose medical conditions by integrating learnings from clinical emergency medicine with data analysis from actual patients. DxtER includes a group of non-invasive sensors that are designed to collect data about vital signs, body chemistry and biological functions. This information is then synthesized in the device’s diagnostic engine to make a quick and accurate assessment. Dynamical Biomarkers Group was awarded the second place of the Qualcomm Tricorder XPRIZE for their prototype, which pairs diagnostic algorithms with analytical methodology in a user-friendly device, all controlled through a smartphone. All competing teams had unprecedented access to a dedicated Food and Drug Administration (FDA) help desk, extensive lab and human testing followed by six months of consumer testing that focused on diagnostic, vital signs, and the consumer experience at the Altman Clinical and Translational Research Institute at the University of California San Diego. The consumer testing included the same rigor and protocols as a clinical trial but focused on the objectives of the XPRIZE competition. Facilitating the testing and R&D for continued Tricorder device development, including continuing the FDA support. Securing relationships with global leaders in retail and supporting demand in the marketplace so that, upon proper regulatory approvals, the Tricorder device will swiftly be given international retail distribution. Creating an educational feature-length documentary with an Oscar®-nominated director, as well as developing a nationally distributed museum exhibit that will foster conversation, public education and awareness to guide the understanding of how these devices can impact and change the future of health care for consumers around the globe. The Qualcomm Foundation has committed $3.8 million towards promotion of the digital health ecosystem, including the continuation of consumer testing, guidance for the Qualcomm Tricorder XPRIZE teams, and support for further development of Tricorder devices. Specifically, the Foundation has requested a proposal for a $2.5 million grant to the University of California, San Diego, including the Altman Clinical and Translational Research Institute. The balance of the commitment will be distributed to other organizations. An additional commitment by The Roddenberry Foundation to contribute $1.6 million towards the adaptation of the teams' Tricorder devices for use in hospitals and communities in the developing world. A specific collaboration to provide the devices for use to a hospital in Mozambique, Africa. Over the course of the competition, milestone prizes totaling $1 million were awarded to participating teams in recognition of the interim technological achievements. Of the 312 teams that joined in the pursuit of the XPRIZE, six final teams were honored at the award ceremony for their accomplishments, with two of those teams - Final Frontier and Dynamical Biomarkers Group - selected as the top finalists for the consumer testing phase of the competition in late 2016. These finalist teams were successful in meeting a majority of the benchmark criteria for diagnostic accuracy in the competition and exceeded the competition requirements for user experience. Additionally, former semi-finalist team Cloud Dx was honored as the XPRIZE “Bold Epic Innovator” recipient and received $100,000 for demonstrating impact outside the criteria of the main competition guidelines. The intellectual property rights of all teams and individual participants that competed for the XPRIZE, including those that were awarded a prize, are not impacted by their participation and final results. Established in 2010 by Qualcomm Incorporated, the Qualcomm Foundation is dedicated to developing and strengthening communities worldwide. Specifically, the Qualcomm Foundation focuses its human and financial resources in inspirational, innovative programs that serve diverse populations. For more information about the Qualcomm Foundation and Qualcomm Incorporated’s global social responsibility programs, visit www.qualcomm.com/community. TM, ® & © 2017 CBS Studios Inc. STAR TREK, TRICORDER and related marks and logos are trademarks of CBS Studios Inc. All Rights Reserved. Used under license.